Bosch impact tough impact driver bits have been upgraded to deliver 10x life over standard impact bits. With an xtended torsion zone, precision engineering and heat-treated manufacturing process, these bits deliver tough torque and power for longer – and with less cam out. 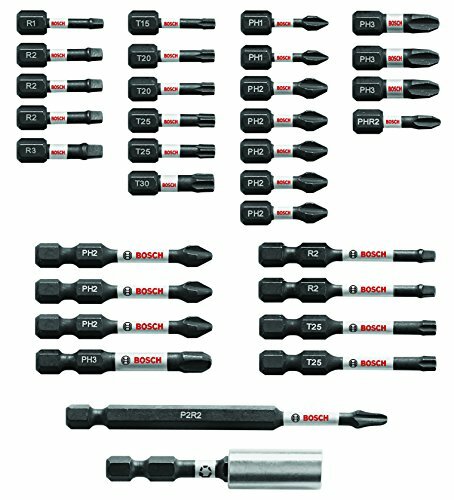 These impact tough bits are an impact-rated line of screw driving bits, double-ended bits, nutsetters, sockets and bit holders that have been enhanced to handle a new generation of higher torque impact drivers. These bits also come with high-visibility sleeves for greater user convenience. LONGEVITY: Bosch Impact Tough Driver Bits have been designed to deliver 10x life over standard impact bits. IMPACT RATED: Featuring an Xtended Torsion Zone, these impact tough bits are an impact-rated line of screwdriving bits, double-ended bits, nutsetters, sockets and bit holders that have been enhanced to handle a new generation of higher torque impact drivers. STRENGTH: The set is heat-treated during manufacturing for strength and a longer bit life. CONVENIENCE: The Bosch SBID32 set also includes high-visibility sleeve with laser-etched markings for user convenience so you can quickly grab the correct bit for the task.